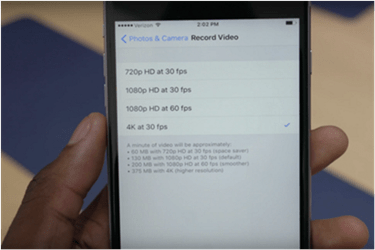 With 4K UHD being a trend, Apple finally includes 4K recording in iPhone 6S/6S Plus. Now users can make and shoot 4k clips with iPhone 6s' gorgeous cinema themselves. Nowhere to experience the ultra hd definition, you can make 4K Ultra HD videos now! At this point, we feel it's high time to have a round review on iPhone 6S 4K recording feature, to guide users how to download, recorded, edit and make the recorded 4K videos ready for upload and playback. 4K Video Recording Causes iPhone 6S out of Space? Export 4K Videos to Mac Right Now! MacX MediaTrans - 100% clean iPhone video transfer software to export 4K UHD videos(Camera Roll incl.) from iPhone 6S/6S Plus/7 to Macbook/iMac to free up iPhone space or transfer 4K UHD videos from Mac to iPhone, regardless of format compatible issues, thanks to the auto video conversion during the 4K video transferring process. The iPhone 6S/Plus supports 4k shooting, enabling users to record/shoot videos in 4K ultra hd with crisper image. Another big plus to use the 4k recording is that when you play the videos on 4K TVs years later, your memories will look so vivid and real instead of dated. 4k is the inevitable future of video, and it's cool that users won't need to import other 4K ultra HD files to iPhone 6S/Plus anymore. While 4k videos on iPhone 6S are amazing, the file size is also an important factor to consider. For example, 4k contains four times the data than 1080p, which means more storage spaces required. In comparison, one minute of 1080p recorded at 30fps is 130MB, while that of iPhone 6S 4K video at the same framrate is 375MB. 3. Re-open your camera and you can shoot iPhone 4K videos with iPhone 6S/Plus now. You can see a 4K icon on iPhone 6S screen. Note: remember that iPhone 6s will remain 4k resolution so you will need to change the settings again if you want to shoot video photos in other format. This is important if you have a 16GB model, or your phone will soon be filled up. Now you have shoot your own 4K videos with simply iPhone 6s, and they look splendid. You can edit the 4K videos and upload them to YouTube, Facebook etc to share with friends. Edit: Users can further customize their recorded iPhone 6S 4K videos with the editors on iPhone. While many mobile editors has no ability to accept videos in 4K, luckily that iMovie has been updated to gain 4K video support. However, this feature is restricted to iPhone 6S, 6S Plus, iPad Pro only. This won't be a problem for 64G or 128GB models, but for 16GB users, they may be caught in a dilemma as there is no enough space to store 4K videos on iPhone 6S, but the iMovie on the Mac doesn't fully support 4K. Sure that the more complicated Final Cut Pro and Premiere Pro will help. Storage: As we have mentioned earlier, three minutes of 4K iPhone 6S video will take up more than 1GB. At that rate, your 16GB iPhone 6S can easily be filled up. Combined with the iOS, apps, other photos, videos, music, you can in fact store only a shot piece of 4K videos. Therefore, it fusses many iPhone 6S users that they have to transfer the 4K videos from iPhone 6S to Mac/PC. But there an annoyance still exists: they can't transfer the iPhone 6S 4k ultra HD videos via iTunes. Playback: Now you may have transfer the iPhone 4K videos to Mac and want to enjoy with your family, only to find that the player you usually use do not support 4K UHD. You may turn to the few 4K UHD players, or just convert the 4K iPhone 6S videos to common-used formats without quality loss. Upload: Many users would like to upload the iPhone 6s 4k recording to YouTube, Facebook or other social sites to share with friends, and of course, gain thumb ups. But sharing 4K videos on iPhone 6S/Plus will be sticky. Again, the large size and output format may be an obstacle for smooth or fast upload. 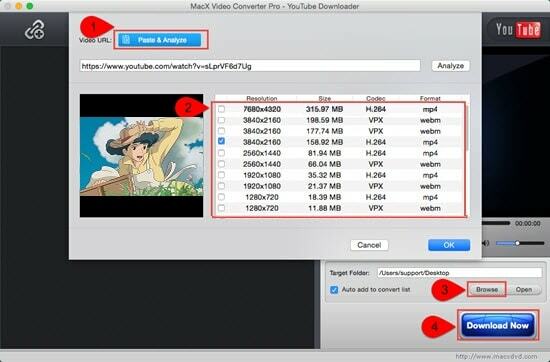 To leave more space, or allow to play and uploading the iPhone 6S recorded 4K video to YouTube, Facebook etc smoothly, MacX Video Converter Pro will be a good helper. This 4K UHD/HD video converter can convert the 4k videos shot with iPhone 6S camera and encode them into MP4, AVI, MKV, FLV, 3GP and other commonly accepted formats. It is noteworthy that this video converter is specially designed for high-definition videos and delivers the WORLD'S FASTEST conversion speed for iPhone 6S ultra HD videos conversion, with the aid of Intel's Quick Sync Video hardware acceleration tech. With almost no quality loss! Furthermore, it also comes with advanced editing features. In fact, this is another aspect the above 4K video converter really excels. It can download free 4K UHD movies from up to 300+ movie video sites like YouTube, Facebook, Dailymotion, Youku, Tudou, keezmovies, Pandora.TV, livestream, Metacafe, and more and convert them to iPhone 6S/Plus profiles (or other iPhone iPad Android devices). Now all the Hollywood/Bollywood 4K Ultra HD videos, songs, music, movies, TV shows, smaples are all ready for playback on your iPhone 6S/Plus. Step 1: Free download the YouTube video downloader for iPhone 6S Mac version (El Capitan) or Windows version for PC users and run it on your computer. Click YouTube button, copy and paste URL of 4K Ultra HD videos to download to iPhone 6S/6S Plus to the box frame. Step 2: Select the video resolution, size, formats you want. For iPhone 6s/6s Plus 4K videos download, it is highly recommended to download 4K videos to MP4 as it keeps high quality and is acceptable by iPhone 6S. Step 3: Select the Output folder to save the downloaded 4k uhd videos for iPhone 6S. Step 4: Press "Download Now" button to start 4k videos download to iPhone 6S/6S Plus. 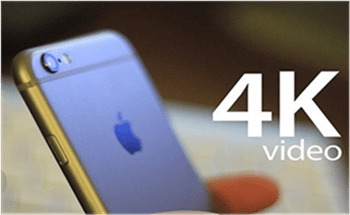 The whole process of iPhone 6s 4k videos download will be completed in super fast speed and no quality loss!